Get the benefits and value associated with Zebra with iMZ 220 & iMZ 320 economical receipt printers. Each tiny iMZ printer can be a smart assistant for mobile receipt printing applications where you need quick, simple receipts on demand. Use 802.11g, Bluetooth®, or IrDA to connect to a handheld or smart phone device and produce crisp, clear receipts! 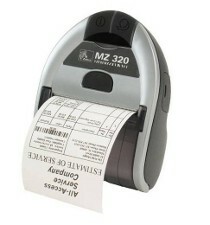 Simple, reliable, affordable and lightweight are just a few words to describe the compact iMZ series receipt printers. Available in 2" (iMZ 220) or 3" (iMZ 320) widths, the iMZ Printer is the perfect entry level mobile printer for route accounting, line busting and other fast pace mobile jobs.